There's no single shopping experience that satisfies my little heart more than a handbag. I can't even explain why. You put stuff into it, and carry it on your arm or shoulder. Um, okay. I do however understand that I am interested in quality over quantity. I'd rather have beautiful staples that I will carry for years to come instead of a giant collection. If I'm going to drop any amount of money on one, it's a well-thought out and researched purchase. I usually think about it for months before taking the plunge. 1) It's the medium size, which I think is perfect for someone my height (5'2). I think the large would be too overwhelming for me. 2) The color. It's the perfect shade of tan, which also means it goes with absolutely everything. It comes in a multitude of gorgeous colors though! 3) The hardware is durable. The saffiano leather is the same as my Micheal Kors Selma satchel, so it's practically impossible to destruct. It has little metal feet on the bottom, which I think is such a great touch. I can see it keeping its shape and structure throughout time. The handles are also very sturdy. 1) The handles are a little too stiff and sturdy, if that makes sense. They feel a bit rigid when worn on the shoulder, so I feel more comfortable carrying the bag on my arm. 2) I really wish it had a crossbody strap for convenience. It's not a shopping bag, let's just put it that way. Great for work, and also as a weekender if you crave the polished look like I normally do. Overall, I would recommend it and am happy with my Winter purchase. I can easily see myself carrying it through Spring and Summer as well. If you have any specific questions, let me know in the comments below! Great job on the detailed review, Noelle! I do think you made a great choice that will get you plenty of mileage for years to come. Thank you gina! I never feel that I'm covering everything in my reviews. For instance, I failed to mention that the lining inside is great and that it has pockets too. It's a very roomy bag! Lovely review... thanks for sharing! Looks like the perfect little tote for both work and play. Thank you Natasha! Happy new year! I'm with you! What is better than a new bag? I believe in investing in quality above all when it comes to getting such a timeless piece. 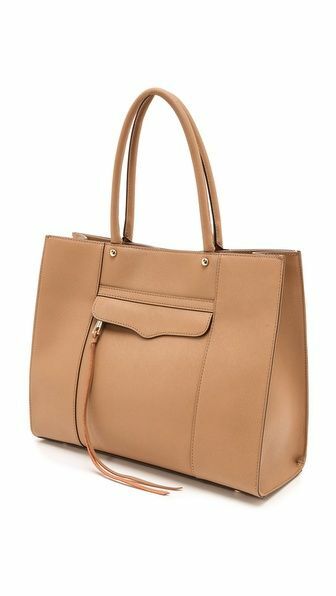 Love the tote and the review - Saffiano leather really is the best, huh? Your bag collection is probably my favorite! You have such a gorgeous collection.